They will select one random random participant. The Winner will be announced on Thursdays when the new Throwback Thursday is posted. To begin my card I first die-cut the past released Birds & Branches Frame die on a watercolor paper to color my branches, leaves, and flowers, I left the rectangled frame white to let the middle pop with the soft color of the watercolor. I then let it dry, then die-cut two more of the frame and glued the pieces together to make the frame sturdy for the card base. 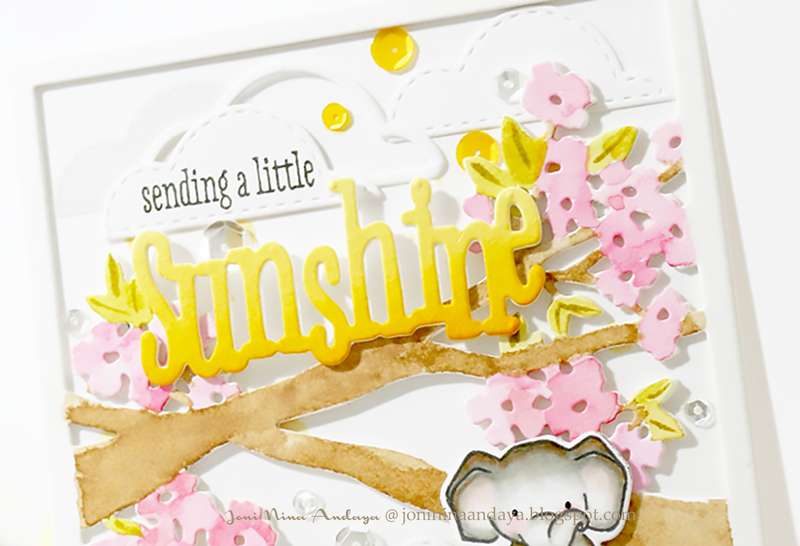 I then adhered the clouds on the card base and the sunshine die-cut was adhered on the branch with glue. I also added the cute ellie from the Unforgettable stamp set, and added some sequins in Sparkling Clear and Marigold from Pretty Pink Posh. If you have not played you still have plenty of time. Use at least one Wplus9 product and upload your project to your blog or online photo gallery such as Flickr. Then link it up using the InLinkz widget below to share it and keep the inspiration flowing! You'll have 3 weeks to play along. Post your creations on Instragram using the hashtag #wplus9tbt for an extra entry! I think this too cute to be true! Love the colours, the products and the lay-out you used. Wonderful card! Ooooh what a delight this is Joni!! Those soft pink blooms and that sweet little ellie just stole my heart! Soooooooooo gorgeous!! 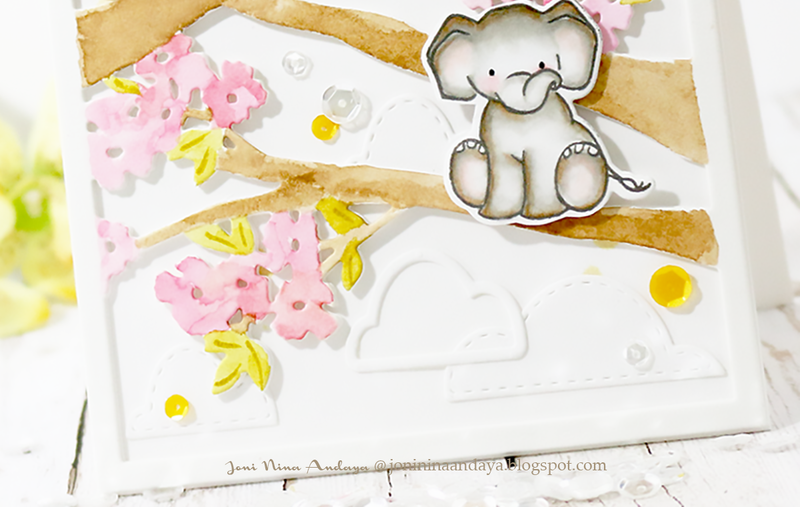 I love love love the branches, the flowers and that adorable elephant!!!!!!!!!!!!!! oh so beautiful!!! 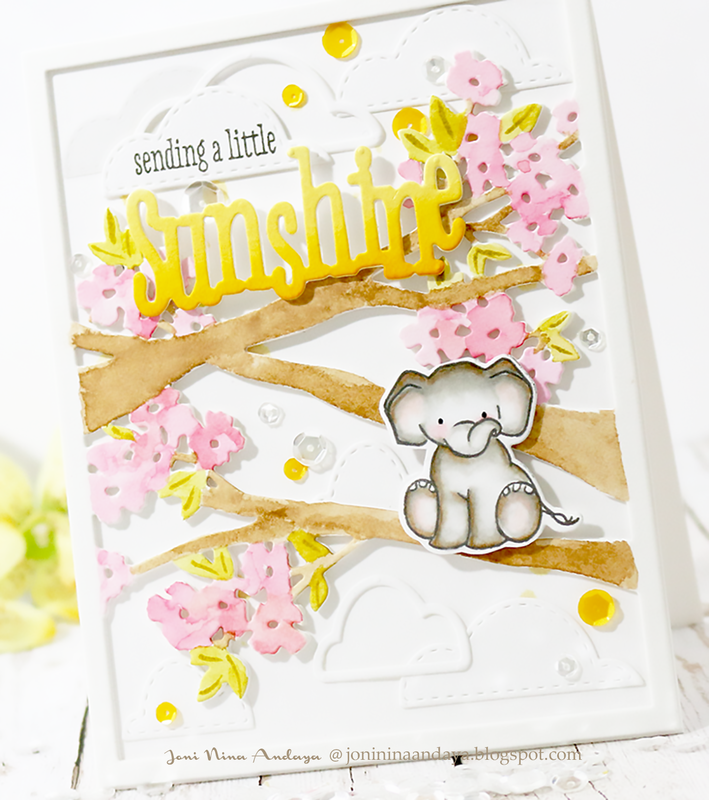 Love the soft colors of the branches and that sweet little elephant! SO Adorable ! I loved the bright n beautiful colors you have used n this card ! This card is so unforgettably CUTE!!! Love that you have a little elephant sitting in a tree!! =) Absolutely gorgeous!! What a delightful card.So spring-y and beautiful! So beautiful Joni. I love that the elephant is sitting on a branch. Oh do I love that scene! And adding Ellie gives it so much whimsy! What a fun, whimsical, beautiful card!